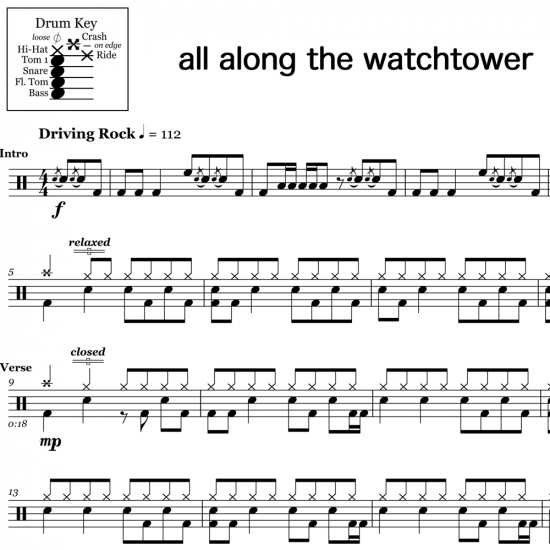 The full drum sheet music for “All Along The Watchtower” by Jimi Hendrix from the album Electric Ladyland (1968). Jimi Hendrix and his band recorded their classic rendition of Bob Dylan’s “All Along the Watchtower” on a four-track recorder only six months after Dylan’s original was released. The form of the song is very simple. A sequence of four chords cycles throughout the whole song, underpinning the intro, verse, and solo sections. True to form, drummer Mitch Mitchell, played a dynamic part, keeping time softly through the verses, and matching Jimi’s screaming guitar solos with complex beats and wild fills.